Is it safe for your dog to eat Cheese? Read more to find out. While curled up on the couch with tasty snacks, it can be tempting to share with a much loved four-legged friend, but are snack items, such as popcorn, bread or nachos, good for dogs? Several dog owners will give their pooch a taste of ice cream, a nibble of cheese and maybe offer straight milk, but while dogs surely love the taste of dairy, as do many humans, it may not be the best for their diet. It may be wiser to provide treats like popcorn and bread to a dog. Many dogs are allergic to milk pro ducts. Just like many humans, dogs can be lactose-intolerant as well. This occurs from the inability to produce enough lactase, which is an enzyme necessary to digest lactose. The result is tummy troubles. Lactose-intolerant dogs typically occur in young puppies and spaniels; however, any dog can develop lactose-intolerance as the dog ages. Although the common symptoms of lactose-intolerance for humans includes flatulence, diarrhea and bloating, dogs can appear lethargic and develop skin rashes in addition to gastrointestinal discomfort, vomiting and loose stools. Dogs prefer better-tasting foods and once they are given the chance to partake in delights, they might turn their nose up at their dog food and other treats. It is wise to take notice to how a dog reacts to milk products before encouraging more. All in all, whether a dog can have dairy simply depends on the breed and particular dog. The most effective way to gauge whether a dog is lactose-intolerant is to give some dairy to the dog in sparing amounts and watch for loose stools and other symptoms. Gradually, but sparingly, increase this amount, but taking heed to not give exorbitant amounts. Remember, these are treats and not part of their main diet. If there are any of the symptoms mentioned above, it’s safe to say the dog is lactose-intolerant and cheese should be avoided. 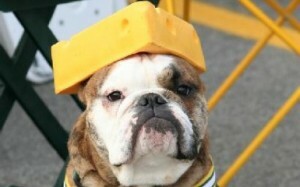 What do other dog owners have to say about whether their dogs can eat Cheese or not? See comments below. We feed our dog cheese tidbits quite often. We’ve never seen any ill effects from it, though I would state a word of caution regarding high sodium content in cheese and low sodium tolerance in dogs. I use a small amount of cheese to give my dogs pills when the vet prescribes them. I’ve tried peanut butter but many times they’re able to eat the peanut butter without swallowing the pill. I’ve got 8 dogs of various breeds from 5 to 40 lbs. and it hasn’t seemed to affect any of them negatively. I don’t give cheese as a treat though. If youreally love and treasure your dog like family, you will not ever give them anything made for people. Even if you see no effects right away, their systems cannot handle the processed, chemically treated, toxic foods made for humans and there will be long term effects! Be better people, they can’t take care of themselves! I agree with John’s comment. We have three dogs, two weenies and a Shihtzu mix. When it’s pill time (and only then) we cut a square of American cheese into thirds. Wrap the pill in one, give it to the one that needs the medication. We give a third to the other two and this way they all think they are getting a treat. We have seen no negative results. Only happy dogs. Know if dogs can or can't eat Cheese? Help other dog owners by leaving a comment.